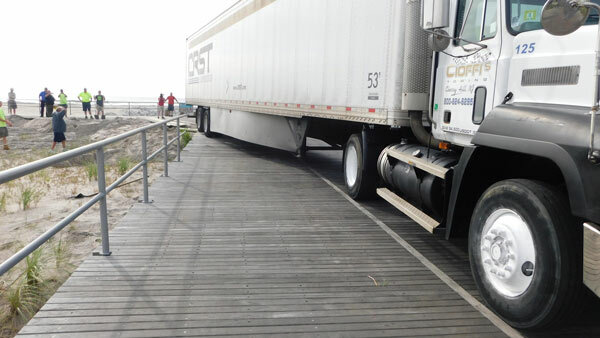 VENTNOR, N.J. -- A tractor trailer driver apparently made a wrong turn and got stuck on a boardwalk at the New Jersey shore. Workers in Ventnor spent Wednesday morning removing benches and railings to help the truck get off of the boardwalk. Police said that the tractor trailer driver first drove onto the boardwalk at Albany Avenue in Atlantic City early Wednesday. It then drove about 2 miles south, close to the end of the boardwalk in Ventnor. The driver wasn't able to make a turn onto a ramp to get off the boardwalk. The cab was later detached and driven off; a tow truck removed the trailer. It wasn't immediately known if the driver was facing any charges.